One of the new features in the upcoming iOS5 is Twitter integration. A user only have to connect to Twitter with his account once. After that, apps have the possibility to post a tweet with the users account. Off course, the user have to agree first. This all happens in a View Controller which developers can access in the TWTweetComposeViewController class. 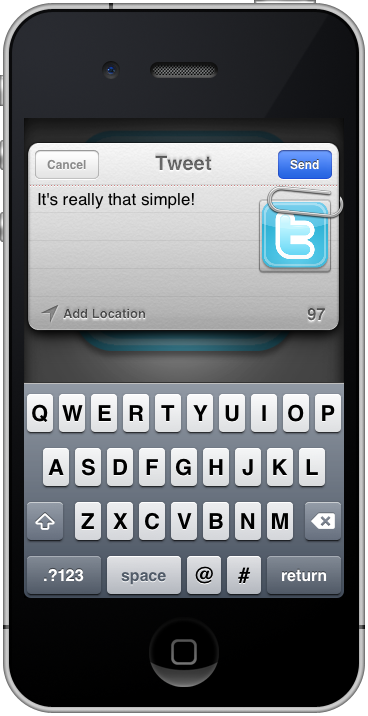 In this tutorial I’m going to show you how to use this class and start using the Twitter integration. You will be surprised how easy this class is to implement. Check the end of this article for a sample project you can download. I don’t explain all the small details. I’m not going to talk about what IBOutlets are and how to use them, that’s the basic knowledge. Please use Google if you don’t understand these details, they are discussed over and over again!